In Vitro actually means “in glass” this technique was successfully established by Dr. Edwards and Dr. Steptoe in the year 1978 following the birth of worlds first test-tube baby Louise Brown at Bournhall clinic in London. This technique has revolutionized the science of human reproduction. In the natural fertilization process the egg is fertilized during its journey through the fallopian tube. 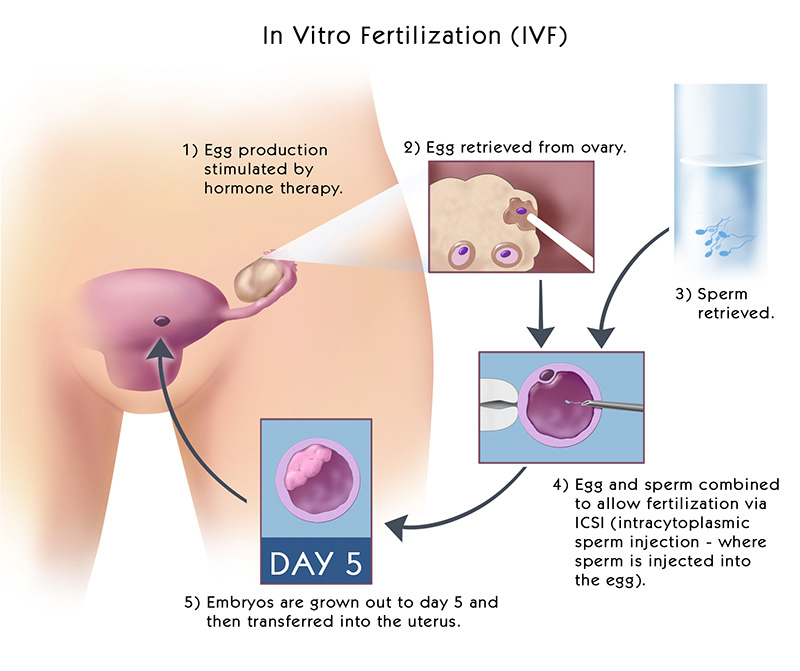 With in vitro fertilization (IVF), the egg is fertilized with the husband’s sperms outside the woman’s body in a special laboratory. After fertilization, the Embryo’s are allowed to grow for a short period of time in the laboratory before being placed into the Uterus. A successful pregnancy can be confirmed about two weeks later. Initially this technique was developed as a solution for infertility caused by obstructed tubes. Later it turned out that this method could also be used for treating other causes of infertility. In vitro provides many people with the opportunity to attempt pregnancy in the face of one or more factors that may otherwise decrease their chances. There are several reasons why you may be better off with IVF. • Multiple pregnancy rates (transfer of the embryos) twins 10%, triplets 1%. The ovaries have to be stimulated to bring several eggs to development. This is the result of a natural hormone (follicle stimulating hormone or FSH) which is produced by a little gland, the pituitary, located near the middle of the brain, during the natural cycle. During the cycle, the body regulates the production of this hormone in such a way that only one egg ripens. However, it is desirable for an IVF-treatment to have several ripe eggs. The pituitary activity is temporarily suppressed, briefly and at the same time as the stimulation (subcutaneous injections for 7 days) or several weeks before the stimulation (a single injection with a long-term effect product or a daily administration with a nasal spray) in order to achieve this. The medication used has a very selective effect on the production of FSH and has no negative consequences. FSH is injected daily. On average, stimulation takes 12 days, but this can vary from 7 up to 21 days. 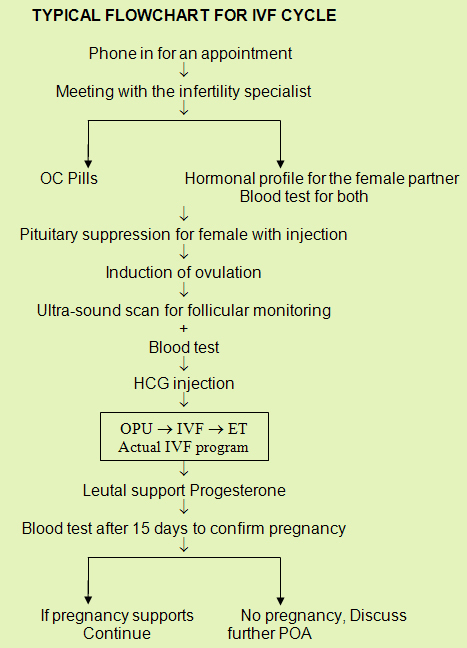 There are different hormonal preparations on the market. The doctor will discuss with you which preparation is the most appropriate for you. In some patients no pituitary suppression is done and direct stimulation starts from day 1 or day 2 of cycle depending upon individual patient requirement. We closely monitor the course of the stimulation by serial ultrasound scans and blood samples. This is necessary to be able to adjust the stimulation and to determine the exact moment on which the eggs are ripe and can be fertilized. When the follicles have a diameter of about 20 mm, the final phase of the egg maturation is initiated with an HCG injection. The egg cell puncture takes place 34 to 38 hours after this injection. With a fine needle the vaginal wall is punctured under vaginal ultrasound surveillance and the follicular wall is pierced, the follicular fluid containing the egg is then aspirated. We usually perform the ovum pick up or oocyte aspiration under general anesthesia. The type of anesthetic approach used will be discussed in advance with your treating doctor. You will have to remain under medical supervision for a few hours after the puncture. The possibility of complications (bleeding, infection) is extremely low. The puncture rarely causes infection (risk less than 1/1000).